She filled the role of dog very well. Forever labeled “man’s best friend,” she was absolutely that. When reflecting on the legacy of my faithful yellow lab though, it’s the “friends of this man” that her paw print has left that showcases the remarkable life of this dog. Sage left us yesterday, November 23, 2013, after a short battle with what our vet believes to have been a brain tumor. If friendships were to be plotted like a family tree, there are so many branches in my life that would connect to a trunk like that of a century-old oak tree. And that trunk, with its roots, would be Sage. And to think that she was able to do that in 10 short years. Ric Aikman, Richard Faulkner, Tony Hawkins, Brad Taylor, John Comey, Chris Tester, Jason Watkins, Keith Trexler, Cam Watson, Mike Parker, Steve Ledford, Tara McCreedy, Jim Swart, Robbie Julian and on and on and on. Some of those folks are some of my dearest friends. Without Sage, I’d know zero of them. Not one. The affect she made on friends I already knew, or would find without her help, is remarkably deep too. We didn’t have a hunting show and quit running hunt tests before Sage was 3-years old, but her impact was far reaching. The short notes and texts that came to my phone yesterday, many toting “Remember When” stories, helped ease a lot of pain losing a dog can create. 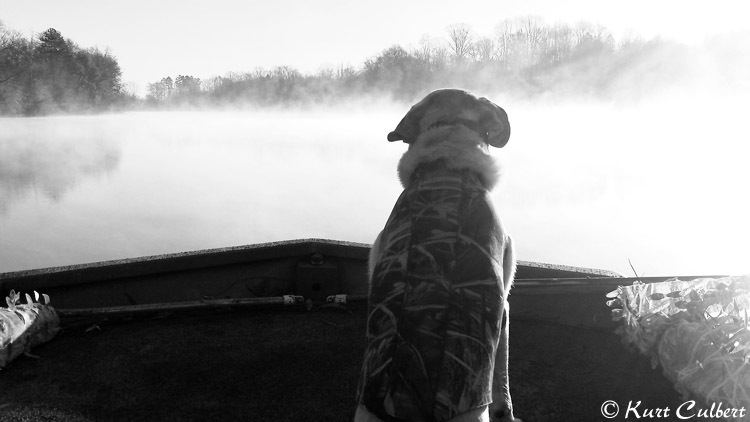 There were her first retrieves and the retrieves she made of “first ducks” for no fewer than three youth hunters. Trips to the coast where she refused to let cold January weather stop her from her favorite hobby. The retrieving demonstrations for bystanders awed by a working dog, and even a few months of joining Burgin Hardin and me in a downtown Charlotte office. Neighbors and friends considered her part of their lives. The texts and e-mails that came in didn’t have line of sight to some of my favorite memories of Sage. You see, for as much as she was a great hunting companion – one that was limited only by the flaws of her trainer – her best role was that of our family dog. My wife and I were damn near newlyweds when Sage became our biggest responsibility. For five years as our “only child,” she was a great test for us becoming parents. We’ll never forget those annual Christmas card photo shoots and those funny birthday hat pictures each time Sage celebrated another year. For some reason, she loved the feel of a curtain on her back. We called her “Sister Sage” when she sat in those window curtains as they resembled a nun’s veil flowing over her head. Never forgotten will be those on-the-road phone calls from my wife imploring me to command Sage to “drop” over the speaker phone in order to end a game of chase with a sock, a toy or whatever Sage had decided to run around with that day! Countless “Marley and Me” instances evolved into her serving the role of protector, for my wife while I was traveling and for my kids as they entered our world. I’ve heard of other dogs acting like she did, but it was incredible to see Sage lay in front of the nursery door for both of our children as infants. Their cries were met by her pacing near my wife and me, all the while making sure we knew our attention was requested. Enough cannot be said about having your best friend meeting you at the door after work, unable to care less about how your day was and hoping only that she could find a way to serve you. The wagging tail said everything you needed to hear. Today I spent some time packing up a number of her things. It’s not as though I’m trying to remove her completely from our lives. There are too many great memories to make that remotely possible. However, each time I walked by a dog dish or saw a retrieving bumper in the garage, it led to a great deal of sadness. Few were more sorrowful and long than the 21-step walk I made this morning to retrieve my paper. That’s a job Sage relished for the better part of the last 300 or so Sundays. I’ve been asked several times if we are ready to get another dog. We’re not yet. We definitely will be at some point, but our lives have become a bit hectic as our young children become more active. For now, we will chip away at the sadness knowing full well the memories will turn at some point from tears to smiles. Thank you, Sage, for being my best friend. Thank you for leaving an indelible mark on our family. Thank you for making so many lives, so much better. Rarely allowed on furniture, there were some exceptions! She accepted the role of pillow for Reid. The eyes are showing she’s grown up. One of my all-time favorites of me and Sage on a hunt! A morning hunt wraps after another experience. This entry was posted on Sunday, November 24th, 2013 at 9:38 pm	and tagged with Duck Dogs, Losing a Pet, Sage Culbert and posted in 2013, General Tales, Uncategorized. You can follow any responses to this entry through the RSS 2.0 feed. Thanks for sharing the Kurt. I know it will take some time, but I hope that very soon your memories and reminders will lead to a smile on your face more often than sadness. I never met Sage but it’s clear she was a great friend and member of the family. You and your family gave her a great life, and you’ll always have her in your heart.